Patrick McNamara, Ph.D., is an Associate Professor of Neurology Department of Neurology at the BU School of Medicine and the VA New England HealthCare System. 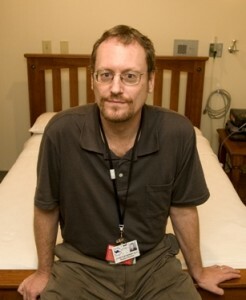 Upon graduating from the Behavioral Neuroscience Program at Boston University in 1991, he trained at the Aphasia Research Center at the Boston VA Medical Center in neurolinguistics and brain-cognitive correlation techniques. He then began developing an evolutionary approach to problems of brain and behavior and currently is studying the evolution of the frontal lobes, the evolution of the two mammalian sleep states (REM and NREM) and the evolution of religion in human cultures. He has published numerous articles and chapters on these topics pioneering the investigation of the role of the frontal lobes in the mediation of religious experience.